* Threads can now have "thread local storage". that runs when the thread dies to carry out any needed cleanup. Mainly used to delete thread local storage. Java VM and set of class libraries. 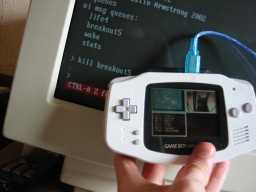 JaysOS is a "toy OS" that runs on the Gameboy Advance. It provides preemptive threads, semaphores, condition variables, and message queues. a version of Conway's Life, and a cpu usage displaying app. As of 0.2, it also includes a port of the Waba VM for Java bytecodes. Waba comes with a few interesting demo applets you can try out. and allows you to control what is going on using simple commands. Another limitation of JaysOS is the lack of proper system calls. In most OSes, user apps communicate with the kernel through software interrupts. they can't be used to call into JaysOS. Apps have to call kernel functions directly. As of version 0.2.0, there is a heap manager, but it is only used by the apps. The kernel itself uses only statically allocated data structures. Static memory allocation means a lot of things are fixed in JaysOS. There is a maximum of 32 threads for instance. 1.2 WHAT IS THE POINT OF THIS? None really, other than my own amusement and education. JaysOS is not meant to be useful or to represent my idea of how a real OS should work. Design decisions were made based on whatever I felt like having a go at that day. Hopefully it might serve as a basic introduction to operating systems, or as a simple threading system for GBA apps, or you might even be able to use parts of it for embedded applications. I've tried to make the code as simple as possible. Feel free to steal any bits of code that might be useful to you. 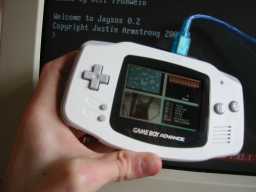 You control the apps running under JaysOS with the buttons on the front of the GBA. and try to keep the ball in motion. I haven't bothered to implement different levels, score or anything fancy. the simulation with a random arrangement of cells. concept of an "active window". The active window is the only one which receives button events. 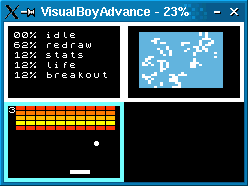 The active window is drawn with a blue border. You can change the active window by using the buttons on the top of the GBA marked "L" and "R". similarly with homebrew serial cables too. Set up your terminal software to 9600 8N1 ANSI mode. 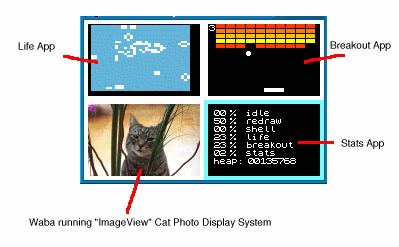 while the Gameboy logo is displaying until it prints "Coded by Jeff Frohwein". That is actually coming from the MBV2 and is nothing to do with me. Now type "U" until you see a message welcoming you to JaysOS. 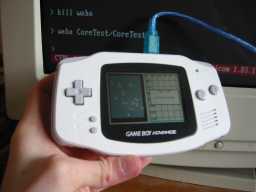 If it doesn't work try "rebooting" your GBA and trying again. You can type "help" to get a list of recognised commands. 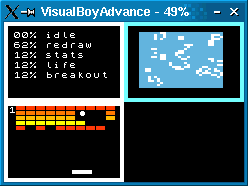 with the UI Manager: "life4, "breakout5", "waba" and "stats". of apps by changing which ones are started in main.c and recompiling. "official" Sun standards (like J2ME). See waba.sourceforge.net and www.wabasoft.com for more on Waba. You can only have one instance of waba running at a time. The README tells you everything you need to know. Wilhem Meignan has developed a derivative of JaysOS, called ISOS, for his robotics projects.